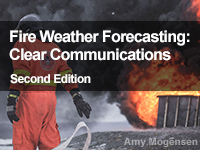 This lesson will introduce National Weather Service (NWS) forecasters to the communication strategies used for decision support services during wildland fire incidents. It also serves as a baseline for practices that leverage unique NWS capabilities to assist land management, firefighting, and emergency management entities in critical decision making. The learners will work through a simulation to see the effects of their communication choices on decisions made by fire personnel. The lesson replaces an earlier edition produced in 2008. Awesome course, communication is most important in wildfire and prescribed fires. This course gives you that knowledge that you can and should use in any event. Really like the the examples in this training putting us in a similar situation during our fire weather forecasting challenges. Overall a great lesson. Helpful to understand the inner workings of the NWS Fire desk. I strongly recommend that you included in this lesson the WFO, ROC and SPC each have there own levels of responsibility. In most cases, the WFO does all the DSS with local authorities while the ROC and SPC will do DSS with their peer level agencies (FEMA, etc). This was not explained in the lesson right away but after some confusion was created. I would like to see a broader spectrum of teaching strategies employed. A combination of animated, video and audio components would be preferred. A lesson that is solely read can be tedious. fascinating material, well organized, good length, well designed pages, challenging questions requiring careful reading but doable! One thing I didn't like about this class is the simulator. I didn't do it cuz I dislike'em. A minor update was performed in late summer 2018. Images were added to the communication simulation.